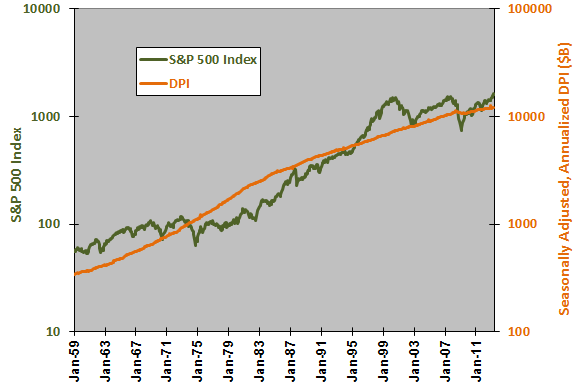 The following chart compares the behaviors of the S&P 500 Index and DPI, both on logarithmic scales, over the entire sample period. Although both series generally rise over time, the large mismatch in volatilities makes it very difficult to discern any exploitable relationship between them. For a closer look, we relate monthly changes in the two series. 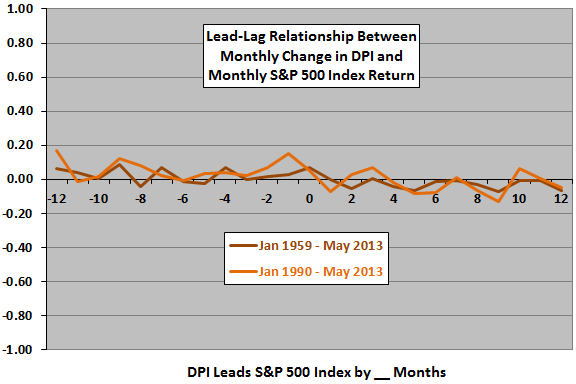 The next chart shows Pearson correlations for various lead-lag scenarios between monthly changes in DPI and monthly S&P 500 Index returns, ranging from the stock market leads DPI by 12 months (-12) to DPI leads the stock market by 12 months (12), both for the entire sample period and a recent subperiod. Correlations are small and noisy, with little or no evidence that either series materially leads the other. In case there is a longer-term relationship, we relate quarterly changes? 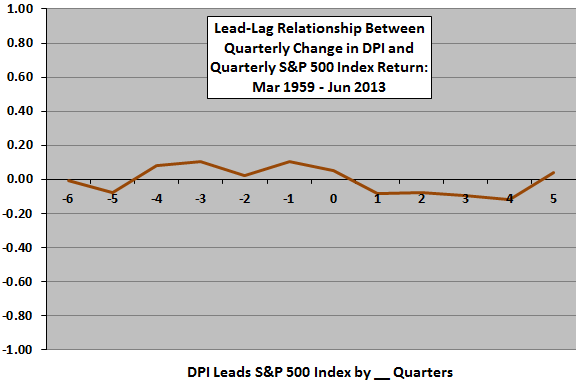 A relatively strong (weak) stock market over the past four quarters has some positive (negative) effect on future DPI. Relatively strong (weak) growth in DPI over the past four quarters has some negative (positive) effect on the stock market. Because the relationship appears to be multi-quarter, we look at annual correlations. 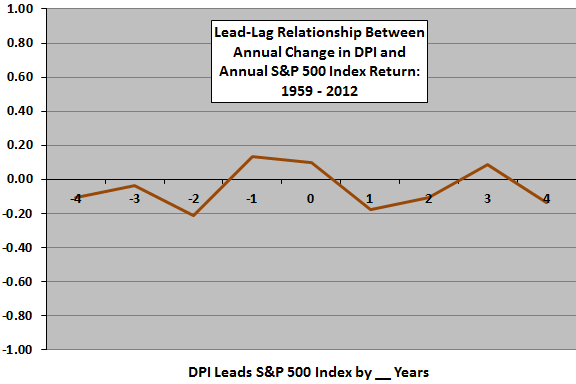 The next chart shows Pearson correlations for various lead-lag scenarios between annual changes in DPI and annual S&P 500 Index returns, ranging from the stock market leads DPI by four years (-4) to DPI leads the stock market by four years (4), over the entire sample period. While correlations are noisy rather than compelling, results do not contradict the above findings. A possible interpretation is that DPI (post-tax income) reacts slowly to economic development, while financial markets react quickly. In summary, evidence from simple tests weakly supports beliefs that changes in Disposable Personal Income: (1) do not usefully predict stock market returns at a monthly horizon; and, (2) may be slightly contrarian at quarterly and annual horizons. As noted, correlations are generally weak and noisy, undermining confidence in findings. Analyses are in-sample and findings may differ for extended subperiods.